NEW YORK (CNN) -- In the largest settlement in the history of U.S. securities fraud cases, Enron shareholders and investors will split more than $7.2 billion from financial institutions accused of playing a role in the energy giant's downfall. 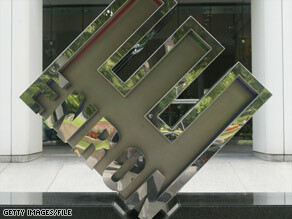 About 1.5 million people will share the $7.2 billion Enron settlement, an attorney said. About 1.5 million people and entities are eligible to share in the distribution of the money, according to Dan Newman, a spokesman for the law firm that represented the lead plaintiffs. "Investors will get an average of $6.79 per share of common stock and an average of $168.50 per share of preferred stock," Newman said. To be eligible for the settlement, investors and shareholders needed to have purchased Enron or Enron-related securities between September 9, 1997, and December 2, 2001. Texas-based Enron collapsed in 2001 after revelations of fraudulent accounting practices. Several former executives were convicted and sentenced to prison terms on charges relating to the accounting scheme. The fall of the company cost 4,000 employees their jobs and many of them their life savings, and the collapse led to billions of dollars of losses for investors. Newman said that the firm hopes to make a distribution by the end of the year. "The order approving the plan of allocation is a big step toward that goal," he said. U.S. District Judge Melinda Harmon in Houston, Texas, approved the plan Monday. Harmon also granted attorneys' fees in the amount of 9.52 percent of the recovery, or approximately $688 million, plus interest. "We're pleased that the court recognizes the tremendous amount of work, skill and determination required to overcome significant obstacles in this complicated case and recover over $7 billion for defrauded investors," said the attorney for the lead plaintiffs, Patrick Coughlin of Coughlin Stoia Geller Rudman & Robbins LLP. The settlement includes payments of $2.4 billion from CIBC, $2.2 billion from JPMorgan Chase and $2 billion from Citigroup, according to court documents. Smaller amounts come from Arthur Andersen, Lehman and Bank of America. The deal and the attorneys fees are the largest in history in a U.S. securities fraud case, according to court documents. The financial institutions were accused in the lawsuit of participating in fraudulent accounting practices leading to Enron's collapse.